What is with the MBS market? One day we see 20/32 gains and the next we are right back down with two days of 12/32 losses just to remind us of where we are. This is a very volatile time for bonds, both from seasonal and market conditions and we are seeing that on a daily basis. How long does this continue and how big of a factor does Europe and our own economy come into play? As the Federal Reserve continues to debate if our own recovery is strong enough and if Europe can continue to prop up Greece before it definitively raises the prime rate, all we can do is sit and wait, before inflation takes hold. If all the cards don’t fall into place exactly how they need to the only solution may be to keep the prime rate at all-time lows and, in turn, keeping rates low for an extended period. This will be a very telling summer as news continues to come in about the health of the economy and give us a sense of direction and hopefully some stability in the bond market. As you talk to your Secondary and Capital Market buddies maybe offer them a drink or a day off. It’s going to be a long ride and hopefully we all come out ahead once it’s settled. Plaza has released updates to their Correspondent Seller Guide and Appraisal Fee Schedule. Two Harbors has updated their LLPAs with changes to the Jumbo program and the Jumbo High LTV program. Chase has released updates to their Best Efforts Rate Sheet as well as other pricing updates. BB&T has updated their Lending Guide sections for Conforming & Super Conforming Underwriting Guidelines, and Conventional Overlay and Allowances Matrix. Fifth Third has announced the rollout of the FHA product, and price improvements and updates for the Jumbo Fixed 30-Year. PHH has released an underwriting announcement for co-ops located in New York and for updated LLPAs. Endeavor America Wholesale has moved the states of GA and IL from Zone 1 to Zone 2. First Guaranty Mortgage Corporation has discontinued their NonCon TPO Jumbo Program, effective May 8, 2015. REMN Wholesale has released their May pricing specials. Platinum Mortgage has updated their FHA Handbook. Guaranty Trust has posted a new Jumbo ARM program with improved pricing, different caps and lower margins, effective May 11, 2015. EverBank is removing the Adverse Market Delivery Charge on Fannie Mae and Freddie Mac products, effective May 26, 2015. Ditech has announced the expansion of VA products to permit manufactured housing. Caliber is now offering a pricing special for Colorado loans. American Financial Resources are making modifications to their existing Jumbo program. Stearns is no longer requiring credit qualification on HPMLs for FHA Streamlines and will accept FHA Rebuttable Presumption. NYCB is updating their Loan Level Pricing Adjustments. 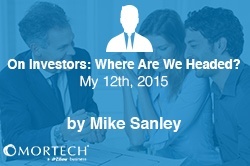 Each week we blog about investor updates and happenings in the mortgage industry.